Mish's Global Economic Trend Analysis: Initial Unemployment Claims Plunge to 262,000 - Lowest Since April 2000; What's Going On? Initial Unemployment Claims Plunge to 262,000 - Lowest Since April 2000; What's Going On? Initial unemployment claims plunged to 262,000 today bettering the Bloomberg Consensus. The Fed is ready now to pull the trigger at anytime and today's jobless claims data may have their finger a little itchy. 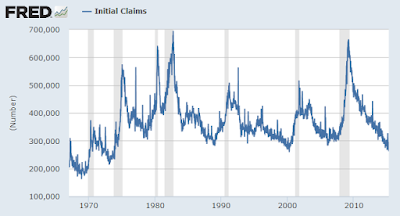 Initial claims, not skewed by special factors, plunged 34,000 in the April 25 week to 262,000 which is the lowest level since all the way back to April 2000. The 4-week average is down 1,250 to a 283,750 level which is just below a month-ago and points to improvement for the April employment report. Continuing claims, where reporting lags by a week, are also at or near 15-year lows. In data for the April 18 week, continuing claims fell 74,000 to 2.253 million with the 4-week average down 18,000 to 2.291 million. The unemployment rate for insured workers is at 1.7 percent. The Labor Department says there are no special factors in today's report though adjusting for weekly data surrounding Easter, which fell late in April last year, is always tricky. Still, on its face, today's report speaks to solid improvement in the labor market and to a big bounce back for the April employment report. Initial claims are in the basket of leading indicators. 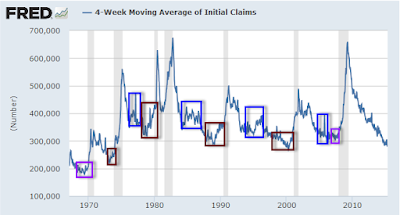 Blue boxes show four occasions where claims turned up strong and no recession occurred. Red boxes show four occasions where claims turned up and a recession followed later. 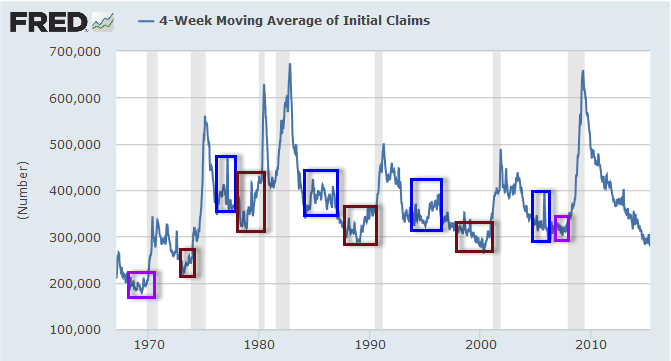 The purple boxes show two occasions where claims bottomed just as recession started. I suspect the next turn higher, whenever it occurs, is likely to be significant. There will not be much of a warning. Other data suggests a recession may have already started. Reader Tim pinged me with this thought on the numbers. We have talked of "job growth" under Obama and how a large number of part-time jobs were created that have led to people needing more than one part-time job to make ends meet. Of course, this is a two-edged sword. You lose one part-time job, and you cannot file for unemployment because you have another part-time job! My daughter holds three part-time jobs totaling 43 hours and is categorized as "full-time" by the BLS because she works more than 32 hours a week. One of those jobs just ended. She will drop to 28 hours total and be classified as part-time, with no unemployment eligibility. This is another hidden Obamacare impact, and a probable reason for the huge drop in unemployment filing. Tim refers to the classification of a full time job as 30 hours under Obamacare. In response, many fast food and retail stores slashed worker hours to 25 or less forcing those workers to take on second jobs. This inflates the strength of the job reports and the initial unemployment claims reports as well. Because of all the multiple part-time jobs people hold, there may not be much of a jump in claims when the recession starts. It's possible there is no jump at all, just cutbacks in hours. For discussion of the idea a recession may have already started, please see Real Q1 GDP 0.2% vs. Consensus 1.0%; Disaster in the Details.